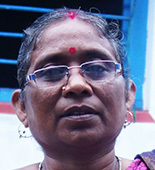 Forty seven year old Kajoli Hansda has been singing all her life. She started learning at an early age, picking up songs from an older women as she wandered around with her, tending the family`s goats every morning, before school. When her marriage was arranged with Motilal Hansda, already well regarded as a musician and a radio artiste as well, Kajoli was endlessly teased by her family and friends about how she would now face competition. Being in class VIII only at the time, the confident Kajoli was not daunted in the least. She quietly began to practice on her husband`s harmonium when he left for work, making sure to place the instrument back just as he had left it. Her secret did not last long however and her husband realizing her passion, encouraged her to train her voice. A thrilled Kajoli took the plunge and before long , she began to accompany her husband during his programmes for All India Radio and later for Doordarshan. This was 1988 and she continued accompanying him till 2004, when Motilal left AIR. Along the way, Kajoli felt the need for a lighter alternative to the harmonium as an accompanying instrument. She chose the Huka Banam, an instrument so long performed by Santal men only. She requested a local banam expert to teach her and ever since has been using the Huka Banam to accompany her singing. She is the only known Santal woman to play the Huka Banam today.